Amber Rose has branded Kim Kardashian a ‘w***e’ during a bitter Twitter feud with Khloe, and claimed that OJ Simpson is Khloe’s real father. 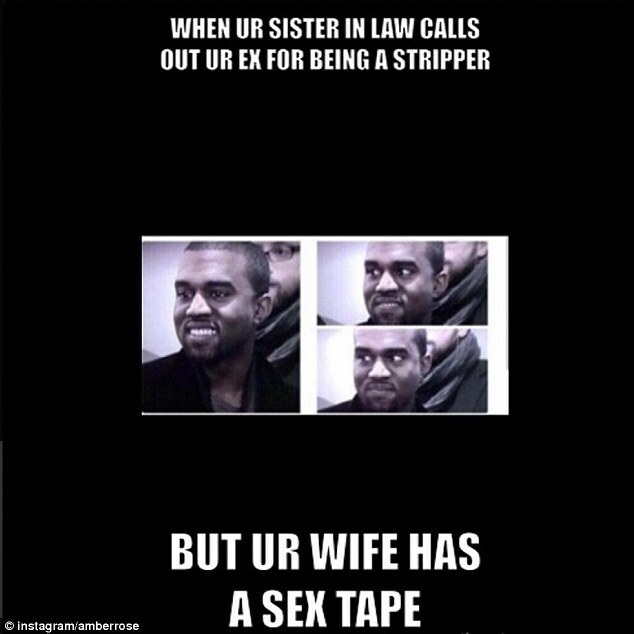 After she blasted Kylie Jenner, Khloe spoke out in her little sister’s defense, and now the model – who dated Kanye West – has some more cruel comments about the family. It all began when Amber called Kylie a ‘baby’ and said she ‘needs to go to bed at seven o’clock’, adding that rumoured boyfriend Tyga, 25, ought to be ‘ashamed’ for dating the 17-year-old. Three days after her interview with Power 105.1’s The Breakfast Club, Khloe fired back, noting that Amber used to be a stripper. ‘“I was a stripper since I was 15 years old,” Amber Rose told Foxx. Please don’t worry about my sister who has a career & her s*** together at ONLY 17. people who live in glass houses shouldn’t throw stones,’ she wrote. 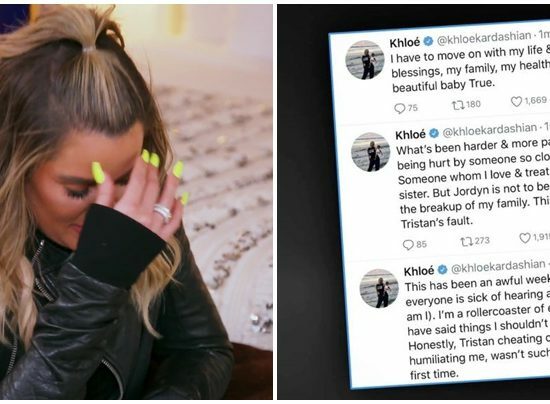 She also appeared to poked fun at the numerous reports that Khloe has a different father from her other Kardashian sisters, suggesting that O.J. Simpson is her real dad. 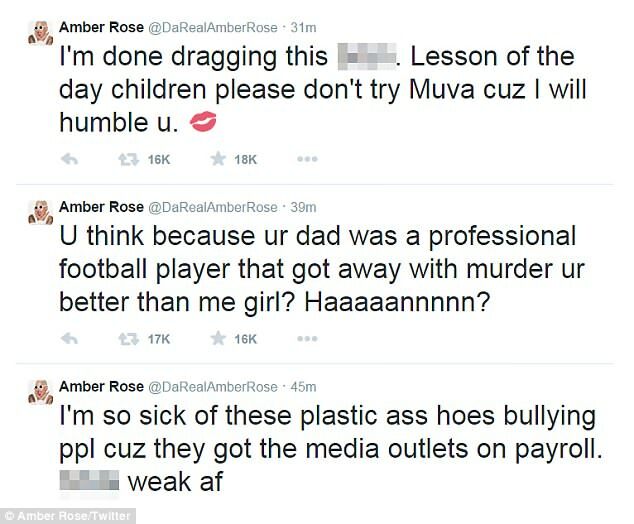 ‘U think because ur dad was a professional football player that got away with murder ur better than me girl?’ Amber wrote. She went on, explaining that the Kardashians are often asked about Amber in interviews but refuse to comment, and suggested she return the favour. 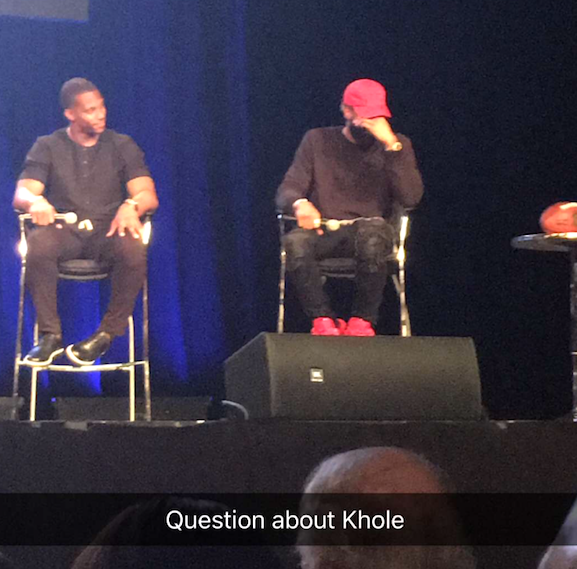 ‘We get asked questions about people all the time and my sisters and I always take the high road and don’t answer,’ Khloe tweeted. ‘Truth is we don’t know these people. I don’t know Amber so why would I comment on her. I’m not going to comment on someone I don’t know. 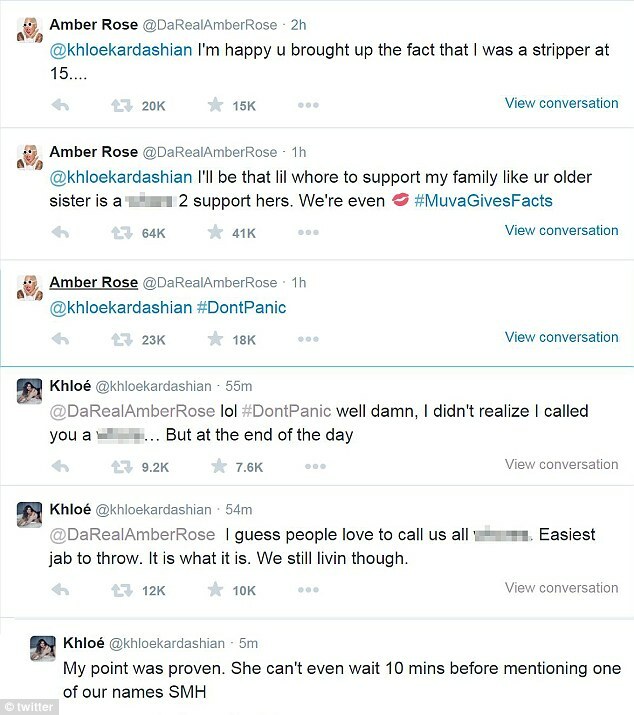 Khloe and Tyga were quickly trending on Twitter following the Keeping Up With The Kardashians star’s posts, and once Amber replied, ‘#DontPanic’ was a top trend.